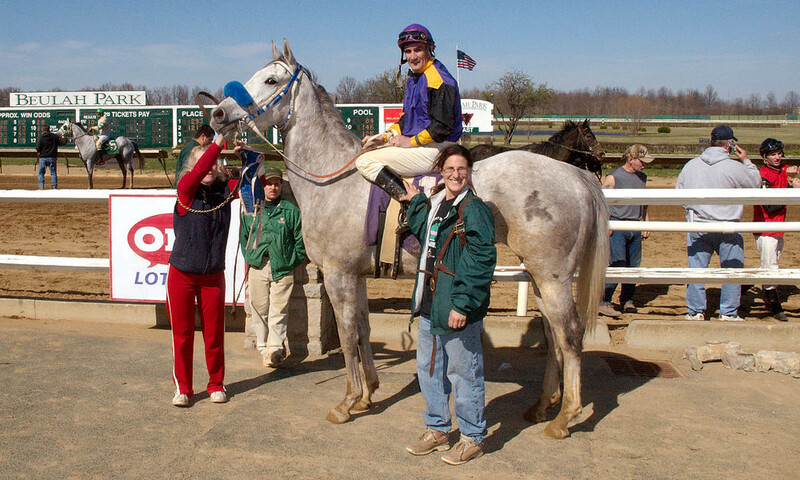 Tacticianor in the winner's circle at Beulah Park, April 1, 2009. Photo by Brad Conrad. Tacticianor, a younger half-brother to the $2.9 million-earner Evening Attire, was rescued from an Ohio auction house last week, and his breeder is hoping to reunite the brothers on a farm in New York someday. Tacticianor was discovered at Sugar Creek, an auction house in Ohio that sells horses who often end up at slaughter, where he was purchased on July 30 for $75 on behalf of Deborah Jones, a California-based horse advocate. The gelding was subsequently turned over to an equine rescue facility in Ohio. According to Mandae Lewis, of Greener Pastures Equine Rescue in Mt. Pleasant, Ohio, where Tacticianor now resides, the 6-year-old gelding has extensive injuries to his hip and shoulder. He is also emaciated, Lewis said. Tacticianor at Beulah Park, April 1, 2009. Photo by Brad Conrad. “He needs care and food,” said Lewis, who added that the horse is being rehabilitated by Amy McLeod, also of Greener Pastures. It is unclear how Tacticianor wound up at Sugar Creek. Tacticianor, a son of Tactical Cat out of the mare Concolour, last raced at Beulah Park on March 1, where he finished fifth in a $3,500 claiming race in the 44th start of a career that began at Belmont Park. His listed owner for the last race was Paul and Patricia Mann and the trainer was Kristi Van Meter. Somehow, the horse ended up with Angela Perry, who has a boarding farm in Ohio. Perry, who said she has rescued horses from Sugar Creek in the past, said Tacticianor was sold off her farm a month ago, but could not identify the buyer. Joe Grant is the breeder and was the original part-owner of Tacticianor – as well as Evening Attire – and was alerted to the gelding’s condition on Monday night. Grant said he gave the horse away in the fall of 2007 to a girl in New Hampshire whom he thought was going to make a riding horse out of him. The horse was back to the races in the winter of 2008 and raced 28 more times. Grant said he plans to send money to Greener Pastures to help with the horse’s care and is reaching out to Akindale Farm in Pawling, N.Y. to see if it could take Tacticianor when he is well enough to travel. Evening Attire, the 2002 Jockey Club Gold Cup winner who campaigned for Grant and T.J. Kelly, was retired to Akindale. “Akindale would be the ideal end to this story,” Grant said. Tacticianor (2004, by Tactical Cat) as a chestnut-coated colt, with his beautiful dam Concolour. Above right: Tacticianor wasn't much of a racehorse, earning ~$16,000 in 44 starts. He's shown soon after being rescued from an Ohio auction house for $75. When Tacticianor's former owner, and breeder, Joe Grant, learned of the horse's condition, he stepped in to help with costs. Eventually, Tacticianor was shipped to Akindale Thoroughbred Rescue to live in comfort with his famous brother. Thank you to Ms. Mandae Lewis, of Lewis Farm and Rescue, for the photo. Happy ending: Tacticianor and his buddy Remington play in the snow at Akindale.